Bluegills are abundant in waters throughout North America; thus, they play key roles within aquatic food webs. 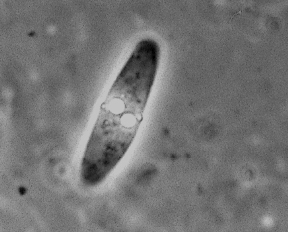 Fry consume aquatic invertebrates known as zooplankton. In short, these young bluegills are secondary consumers. In contrast, adults that consume other fish may be tertiary consumers! Still, some act as primary consumers at times when they feed on algae. Either way, each bluegill must deal with intraspecific and interspecific competition. Intraspecific competition occurs as soon as fry leave the nest. They compete for space and nutrition on a daily basis. Once adults, bluegills compete for space, nutrition, and the right to reproduce. As mentioned in the reproductive section, males display for potential female mates. 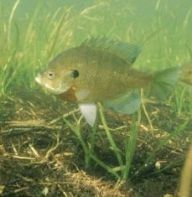 Some males may even creep into neighboring nesting sights to consume bluegill eggs as a way of stunting competition before it occurs. Most evidence shows that the colony of males in a particular nesting site do not partake in this activity, however. 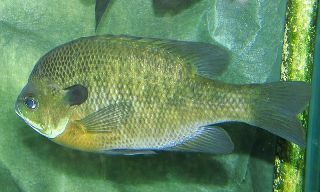 Bluegills often compete with other centrarchid species. Centrarchids generally share nutritional and reproductive needs. It is important to remember that an organism must get more energy from its food than it uses to locate and ingest it. Instead of competing, many adult bluegills travel to deeper water to fulfill their nutritional requirements. The decrease in energy spent searching for food outweighs the increased risk of predation. This strategy often pays off. 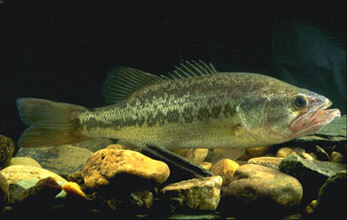 Small lakes in Michigan have up to eight different centrarchid species. Bluegills account for 80% of the entire fish biomass! (Spotte, 2007). Bluegills are subject to predation by numerous other fish species. Immature bluegills fall prey to northern pike, largemouth bass, smallmouth bass, crappie, yellow perch, and even adult bluegills. When they reach maturity, however, they are safe from most aquatic predators because their bodies are too deep. Still, one sneaky predator uses bait, fishing poles, and boats to retrieve a healthy meal. Check out the fishing page to learn more! Bluegills often act as important hosts for parasites. These parasites gain nutrition and a safe environment from their bluegill vector. This causes a decrease in the bluegill's growth rate, yet most interactions are not lethal. Bluegills play host to a variety of trematode, cestode, and nematode species. For instance, a small lake in Barry County, Michigan had bluegills that contained 18 different parasitic species (Pracheil, 2004).